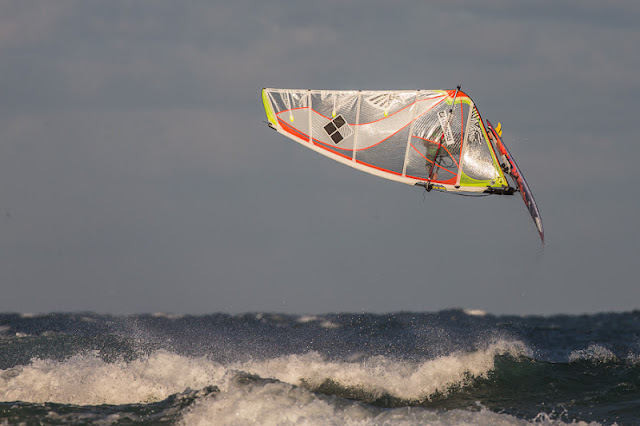 It's been entertaining watching one of our local sailors standout on the BWA windsurfing tour this year. 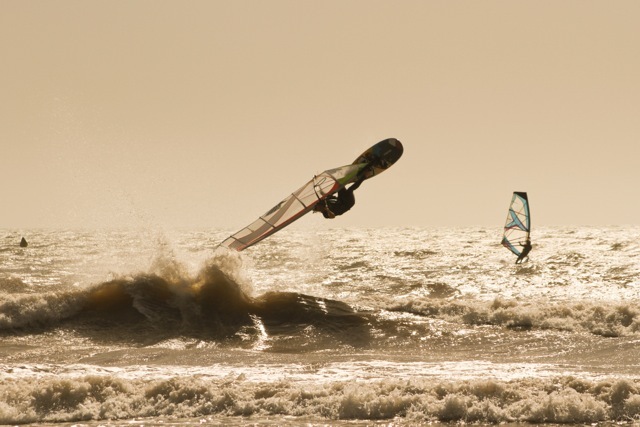 Anyone who sails in the Bournemouth area, will know, that when in the right frame of mind Jim Cox (Coxy as he is known) can windsurf as good as the top pro's. In recent years, I would say that he had always been on too smaller kit in competition. I would always sail a board 10 litres bigger than he was on. When the quatro quads came out though, you could see he started sailing his 85 like he would a 75 - recently he upped it even further and tried their quite interesting 110 litre wave board. Maybe the biggest board on the market for this type of sailing. Competitions are never held in ideal conditions, well a 6 - 8 minute heat is never ideal and the more volume under your feet the better - unless of course the board cannot turn, which is why most stay on smaller boards. The other thing about Coxy, which is good for the rest of us aspiring amateurs, is that he spends most of his time sailing here in Bournemouth, with Gregg, myself, his brother Tim and recently Jamie Hancock who has moved here. We sail at, as you may know, a gnarly beach break called Southbourne. It's generally cross on, has quite a bit of water movement, but can get hell of a wave for a couple of hits. Coxy doesn't spend his winters sailing abroad every single day. Most of the time he spends every single day in a log cabin at the end of his garden talking to his computer in Binary and PHP, and also trying to answer a million emails at once. If you ever phone him, the first thing he says is, can't speak right now... I usually just txt, saying when and where - hopefully he will be out for a power session. Since he came second at the weekends BWA event, narrowly missing 1st place (he couldn't find a ramp for a second jump), I though't maybe he would converse with me if I put an interview up on the blog. So here we are. What kit were you using throughout the competition? On the Friday I used the 110 litre quad all day with a 5.2, which is an interesting combination. Smallest sail to keep that part of it light. With a board that big I didn't need a big sail to get planing. What size boards were other people using? Most on 95's and 85's. I don't think people usually think about using a wave board so big as a 110, a lot of people are curious. Why do you think no one uses boards that big? Because they havent tried them, the other reason is that as well as they turn, they are not as responsive as a smaller board for obvious reasons. Even so I did get one of my best turns the whole weekend. Interestingly it wasn't that light on the Friday, it was very patchy 5.7 to 4.7, coming through in really long gusts. What were you using on Saturday? How did that feel in comparison? Really grippy turning on a wave. felt good to be on smaller board finally and more control, there was a lot of whitewater. I think it helped me maintain my speed in the turns when others were not. What was it like waiting around all day for the double? After the final finished, I came in got changed immediately, listened to music in the grass sand dune area. I was enjoying watching people windsurfing. I didn't practise before my heat, I had a bad ankle so had to preserve that. A forward in my heat against Ben made my ankle worse. What was it like beating Ben? I was relieved to be honest with you, I was watching him throughout the heat. I know starboard tack is more my thing than Ben. He is extremely talented, so the pressure was on my to use my favourite tack to my advantage. I was actually excited about the opportunity. You are about the only person who doesn't spend his winter abroad training? I think it was a benefit for me to be on starboard tack, my equivalent of windsurf training is to fit in windsurfing in the week. We are not really training just trying to improve ourselves. Does it ever want to make you compete on the PWA if you can beat these guys. Are you thinking about the possible title for next year? Erm, In an ideal world I would like to get a higher position overall, so probably not the top slot, but anything above where I am this year - where ever that is. What do you think you need to do to get that? Windsurf a bit more really. Taka consistently on both sides. Are you going anywhere this winter to get port tack? Possibly, it depends on what Lou and I decided to do travelling wise. What about Phil, how was he? He was really positive, he didn't appear to be snapped by the fact he was so close. I felt a bit bad at the start. Timo and Phil got knocked out by Ben and myself. He was frustrated, but dealt it with like a man. The draw seemed a bit strange? Why did they rerun the first final? Well, it was pitch black when we finished the heat, you could't really see the wave pitching. Who was your standout sailor of the day? Probably Andy King for general jumping and activity on the water. Ben's wave riding is always good to watch. Timo was doing some good jumps and Phil did a really nice forward. Jamie was all round good. I think Ben's wave riding is a really nice style..
Do you think our Morocco trip helped? Well, I didn't get the opportunity to get a jump ramp to do tweaked pushies that I had been trying there, which was a shame. Most of it well, Southbourne taught me everything! An overall comment about the competition. It's great to see so many enthusiastic people in the fleets. The ladies the amateurs, the masters. So many people, everyone is really up for it. It's great to see really. There are a lot of personalities, it is a lot of fun, everyone really enjoying and I really hope it continues. The judging panel and the event organisers are all really helpful, so that has got to help, especially if you are a new competitor. They make you feel like you really want to be there and AND IT WILL CONTINUE. The event organisers are doing a great job and deserve reach arounds. Also the BigSalty forecast was pretty much spot on! You did the working man proud!